Pondicherry is a beautiful place for a solo trip. Especially if you like adventure and trying new things. But more than the place itself, it’s always the people that make it memorable and worth reminiscing. I recently visited Pondicherry for a solo trip. And while visiting Serenity Beach one afternoon, with the sun beating down on me, and tottering on one foot to another because the sand was too hot. I saw a few surfers catching the waves. The idea was apparent and staring right at me in my face! I just had to try surfing. There are two surfing schools on Serenity Beach. Mother Ocean Surf School and Kallialay Surf School. Of these I visited Mother ocean surf school to meet the owner. The surfers were out in the ocean but I waited and soon reserved my spot for early next morning. The two instructors I met next day were Marina and Pietro – both from Brazil. They are currently visiting India and traveling across the length of South India. They are working in Mother Ocean Surf School as instructors through Workaway, in exchange of accommodation and food! That I thought was the coolest thing about them. They are humble, hard-working recent graduates, who wish to travel India for one year and at the same time work and exchange culture, memories and of course food! The owner of the school is Shankar. An ISA certified instructor and surfer! He has been surfing for 16 years and now runs a surfing school! I later learnt more about him over lunch. But first it was time to catch some waves! The surf lesson started on the sand first. I carried the surf board out into the beach while Marina helped me set it on the sand. Marina and Pietro helped me mount the board on sand and gave me basic training of how to stand on the board as the wave approaches. Do not let the tail or the front dip in the water! Bend back into your glutes once you’re standing on the board! This was all new and exciting. But I asked Marina to take me to catch some waves soon. Sharkar recommended that we stay in the shallow waters first. 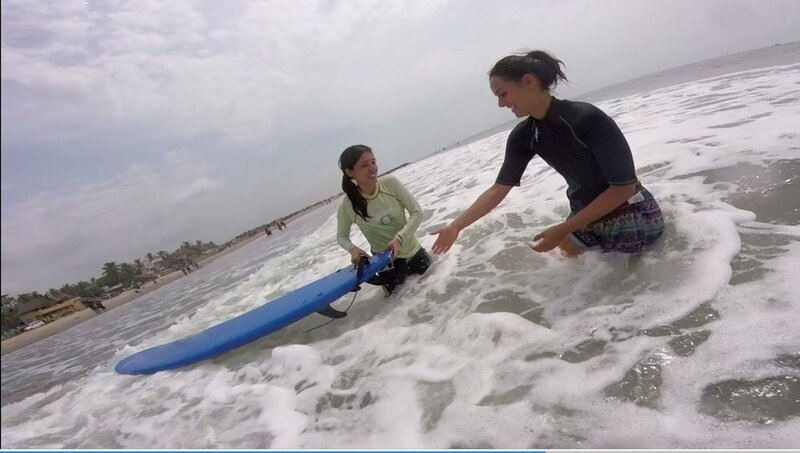 We went into the shallow waters, while Marina helped me on the board. The first wave that comes and makes the board glide is more forceful than anyone may imagine. I wasn’t expecting my board to glide as fast as it did! The first few times of trying to get on the board, I fell under water with the force of the wave. And as Marina said "The ocean makes you feel humble. You realize the power of nature on a surf board"
The surfing experience lasted for approximately one and half hours. And boy it was exhausting. Even though every once in a while we got out the water and sat on the sand and talked. Also, from my numerous times of falling in the salty water, my nose and eyes stung a bit. Haha! Lunch at a Surf School! After the surfing experience, Shankar invited me to the Surf School and asked if I'd like to share lunch with my instructors and him. I readily agreed. For anyone who knows me, they know I live for out-of-the-box, immersive travel experiences! I was thrilled. Shankar came back soon with Fish curry, rice, rasam, fish fry and prawn fry! This was my personal heaven. Especially because Shankar told me how the food was prepared by a local fisherman, with home ground spices! The four of us sat on the floor and ate with our hands, as is customary in South India and with fish curry and rice! The food was not only tasty, it was soulful. Like it was prepared by the hands of God, himself. The most inspiring bit though, was when Shankar talked about surfing in India and how he is so content building something of his own. In his words - "I don’t desire money, I just have to open the door of my house each morning and see the beach, and it's enough". He was such a driven person. Although he loves to travel too, he is fully committed now to build his surf school. Saying Goodbye is the hardest! With that I ended up making 3 friends in Pondicherry, that I still remember and wish well for in my heart. I hope Marina and Pietro travel not just India, but the world. And I hope Shankar is successful in his surfing venture. He was kind enough to share food. And that was the best form of kindness I received during my trip. If you wish to try surfing too, I've added contact details below. Do meet Shankar and say "hi" on my behalf if you do! Alleppey - An immersive experience in the backwaters of Kerala!